Mike Gorrell has been the Chief Information Officer (CIO) for EBSCO Industries since 2014. In this role he oversees all of the technical strategy and execution across EBSCO’s businesses. Prior to his current positon, Mike was the CIO for EBSCO’s largest business, EBSCO Information Services, where he led the creation, ongoing development, and operation of their market leading Internet-based search and discovery services. 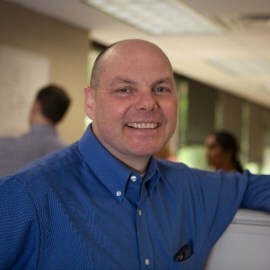 Mike has deep experience in hosting services, user experience, and organizational design. He is part of the leadership team that is bringing Lean thinking and methods to EBSCO’s various businesses, and is passionate about technology, innovation, and helping individuals achieve their fullest potential. A 20+ year veteran at EBSCO, Mike has prior experience as an Engineer with a large defense contractor.